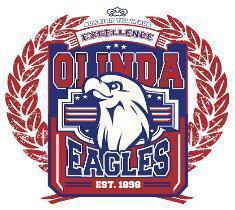 The mission of Olinda Elementary School is to engage students with the concepts and skills necessary for mastering the 21st Century competencies of effective communication, collaboration, critical thinking, and creativity. We foster an atmosphere of cooperation, with respect for individual differences and strong character values. We instill in our students a genuine enthusiasm for learning that empowers them to be confident and productive innovators of the future. Home of the Eagles - Where students are challenged to soar toward their personal excellence!